I can’t even express how much I love the taste of this juice. 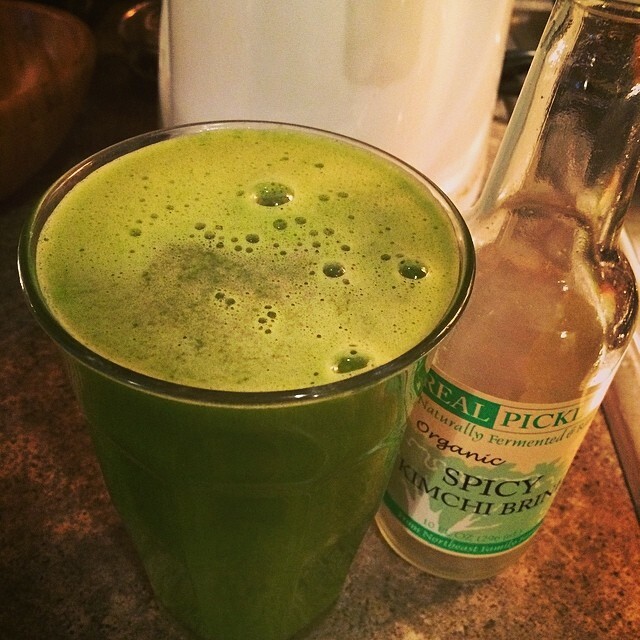 It is my go to alkalinizing recovery detox juice. The addition of Beet Kvass, Kimchee or Sauerkraut brine takes this juice to another level of deliciousness- in addition adding a whole slew of vitamins, minerals, and gut loving healthy pro-biotics. SO YUM. If you are juicing for two, simply double the recipe. I use all organic veggies. Pass all of the vegetables through the juicer. Strain into a serving glass and add in the brine. Drink immediately. On an empty stomach is best. This entry was posted in fermented foods, Gluten Free, greens, Juices, RAW and tagged antioxidants, crossfit fuel, eat clean, fresh, Green juice, living food, pro-biotics, raw, real food, recovery fuel, Savory Green juice, spin fuel, THE VEGAN LOVE PROJECT, train dirty, vegan crossfitter, vegan crossfitting, VEGAN LOVE, veggies, yoga fuel. Bookmark the permalink.